I don't generally watch the new release lists. Unless I am waiting for an installment to a series or something from a much-loved author, I don't really pay much attention. I tend to wait for someone else to read them and spread the word. I sincerely wish I had the time to be a book blogger and read 'advanced reader copies' before they were released, but that is a pipe dream for now. Until then, I enjoy reading other blogs and scoping out what's new in the book world these days. As for anticipating a book release, there is one I'm clearing my schedule for: Promised by Caragh O'Brien. This is the third book in the Birthmarked trilogy. I absolutely adored the first two, and I cannot wait for the finale. Honestly, I'm a bit of a cheater when it comes to these trilogies and series. I usually like to wait until all of the books come out before I begin to read them. I really hate waiting. In fact, when I started this series, I thought all of the books were out already. To my devastation, I finished the second and immediately tried to download the third and what...I have to wait ten months for the next one?! Such cruelty. I hate waiting because I'd rather finish the story while it's still fresh in my mind. And I don't have time to re-read ever series when a new book is released. 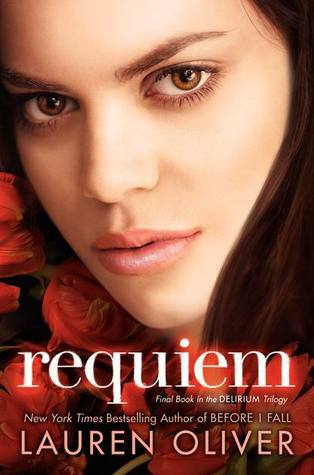 While we're talking about finales: Requiem by Lauren Oliver. I wrote about this series in last week's book chat and I even did a little review of it earlier this year. This book won't be out until March of next year, and after an ending like that, I really wished I had waited until they were all out before I read them. Phenomenal series. I guess waiting isn't too bad. It builds up anticipation. It makes the books that much more fun to read. It's a good kind of torture, I guess. So, what do you think? Do you enjoy reading series? Do you wait for the all of the books to come out, like I do? And what book releases are you excited for? Link up below if you choose to join in! For next week...Share some of your favorite quotes. They can be from fiction, non-fiction, poetry, authors, articles, anything. Hey Jessica! I see a little something new around the blog! The colors are totally unique & I love what you did with the little words in the header. I definitely prefer reading series that are already completed, I feel like I lose the storyline after too long of a wait! Hopefully I'll get my book chat up sometime today. As for series, if it's something I like I pick the book up and then wait very impatiently for the next! Every time!!! Glutton for punishment I guess. And speaking of, off to go do more rearranging.